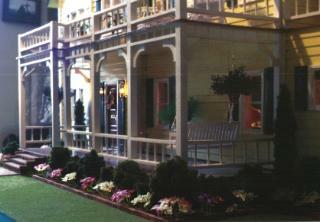 This site is dedicated to Pop's Dollhouse. Please feel free to explore the house and learn the story behind it. 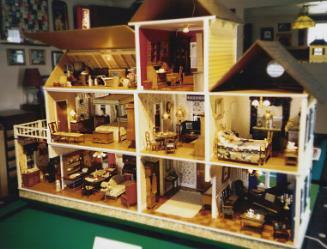 In 1998, my husband and I spent the winter putting together and decorating a dollhouse project that my grandfather had begun twenty years before. 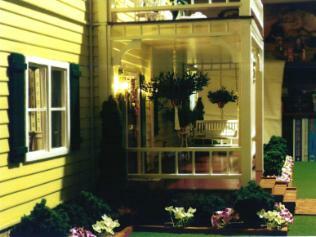 Neither of us had any experience with dollhouses and we learned many things as we went along. My husband utilized his talents with woodworking and electrical wiring, while I was put to the test painting and interior decorating. The results we present to you along with my grandfather's story. I hope you will enjoy this house as we have. Please sign the guestbook and let us know what you think. E-mail me if you would like to trade miniature-related links. 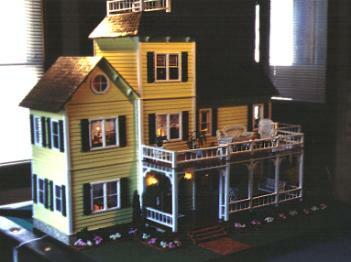 The request I get most often is do I have a copy of the instructions for this house. The answer is yes, and now I've scanned it into .pdf format so that it's available for download. It's a large file, 9 mb.